This is a tough post to write because it is full of nuance and and I’m a bit conflicted. But, I’ll try. First the facts: Yesterday my spouse and dog were walking on San Pedro Mountain trail as we have done 1,000 times over the last decade. A man was walking 3 dogs off leash in the area (this is normal too.) As the groups passed each other, 2 of the 3 dogs associated with the man did the normal dog greeting and passed. The 3rd, viciously and without warning, attacked our dog Gracie. You can see the result in the photo. The man apologized and inquired after the health of Gracie and stated that “this dog was mostly OK.” He then left without providing any contact information leaving my wife with an injured 80 lb dog on the trail. We took her to the vet, (thanks Dr. McKinney!) and got her treated. Fortunately she has up to date rabies vaccination so at least there’s not this worry. 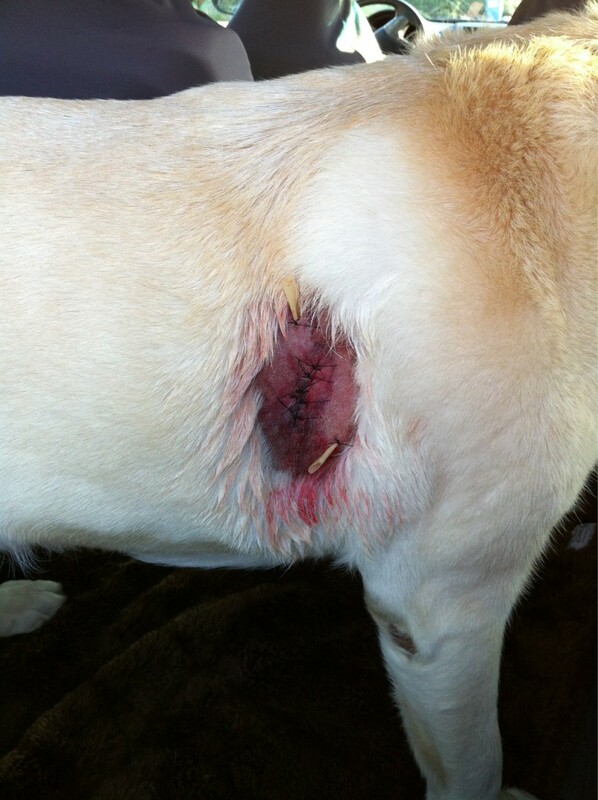 She is now healing though is pretty miserable with a drain in the wound and sutures. So here’s the dilemma. Dogs want to be off leash. Gracie wants to be off leash and we frequently walk her off leash in appropriate areas like San Pedro Mountain trail. We also monitor her activity, pack a leash, carry dog waste bags, and are very careful about having her interact with humans who may not be dog people and other dogs. 99.9% of other dog owners we interact with in the community behave in a similar manner and so there is an accepted community code about how people and their dogs use the open space. However, that 0.1% of dog owners create a real problem for everyone, dog lovers or not. When an incident like this happens I can’t help but agree with leash laws. This small % of irresponsible humans, typically young humans who own pit bulls (or other large breeds with genetic breeding for violence) and walk them without leashes or collars (seriously, I’ve seen this,) are the ones who make leash laws necessary. I don’t believe any dog is “born bad” – human interaction and training play a big role in how a dog develops and behaves over time. But, there are genetic predispositions and sometimes it’s a mystery why things get triggered for an animal. For example, Gracie has a thing about tripods. Anything with 3 legs freaks her out so she won’t go near the object and will bark. We know this about Gracie and manage her proactively as a result around 3 legged things. Here’s the next incident on a related subject. Disclosure, the “facts” here may be open to debate as the story was pieced together from various sources. The same trail and the piece of land it cuts through has recently transferred from the Peninsula Open Space Trust to the Golden Gate National Recreation Area. Which means all of the sudden that US Federal rules come into play about use. One of the consistent US Federal rules is that where dogs are allowed, they will be on leash. Late in January a local man was walking his two lap dogs (i.e., tiny nearly dog-like things) off leash on the same path. A ranger confronted the man about walking his dogs off leash. The man was apparently belligerent stating that his dogs posed no threat to anyone or anything. The ranger then attempted to detain the man and take him into custody. The man refused to be taken into custody and insisted that the ranger give him his ticket and let him go home. The man turned and left the scene with the ranger following (imagine a walking slow speed chase is how it was described to me) when the ranger lost patience and threatened the man that if he did not stop, a taser would be deployed to stop him. The man informed the ranger that he had a heart condition and that tasing him would pose a major health risk and asked not to be tased but still insisted upon leaving. The ranger then tased and arrested the man. I can understand that the ranger was upset about non-compliance here, but come on. This is over walking two lap dogs without a leash in a place people have been walking their dogs without leashes for decades. Poor judgment all the way around. On the one hand, this whole US Federal stance on dogs in a known dog area is nonsense. There is zero need for public funding to be spent policing leash laws. On the other hand, I wish that ranger with the itchy taser finger had been on-hand to enforce the leash law on the owner of the dog that attacked Gracie yesterday. My strong preference is for people to use common sense and good judgment about their dogs with community enforcement of the code of conduct. Having Federal employees administering such minor things seems such a waste and is so heavy-handed as to be laughable. I’m very conflicted about this whole situation. Here’s what I do know. When I walk on the local coastal trails I will be carrying some sort of weapon (walking stick, pepper spray, something) to use in the case of another dog attack. I will continue to walk Gracie off leash as conditions allow and will loudly confront irresponsible humans with dogs and rangers. Most importantly, I’ll nurse Gracie back to health as best I can.